Compassion and empathy improve our ability to interact positively with others. I reflected on these two character traits this week as I watched my girls play with our new neighbors, and I realized that they have both developed more compassion and empathy because of play. Consider these nine ways that play cultivates these two important traits in our kids. Any time two or more children play together, our kids will see emotional expressions like happiness, anger, jealousy, or disappointment. Through this exposure, our kids can begin to understand the normalcy of feelings and identify the emotions they and their peers experience. Kids may understand that they have emotions, but it takes time to learn emotional regulation. Play helps. We parents, caregivers, and teachers can provide play opportunities and guidance as we role-play different scenarios, talk through situations during pretend play, and process emotions and feelings. These play activities equip our kids with self-control and self-regulation skills as they recognize appropriate and inappropriate ways to both express emotions and support peers in a variety of situations. Pretend play and role-playing encourage children to transform into someone else's persona, character, or role. When my girls pretend to be a teacher, cashier, or astronaut, they discover what it's like to live in someone else's shoes, and they begin to develop empathy, which gives them a better perspective when they spend time with family members and peers in real life. While playing soccer, riding bikes, or modeling clay together, kids begin to understand concepts like sharing, communication, and teamwork. They need this cooperative spirit to understand and appreciate others. Waiting in line, constructive play, and sports help our kids develop social skills. They learn how to be patient, wait their turn, share, negotiate, and recognize and read body language. With these social skills, our kids better understand how to relate to others and enjoy improved real-life relationships. Conflict remains part of life, so encourage kids to play and improve their problem-solving and conflict resolution skills. Now that my girls are older, I often let them work through disagreements about which game to play or who gets the ball first because I want them to understand how to respect others and remain calm and kind as they resolve differences. One of our new neighbors doesn't talk much because of trauma from a recent accident, but I've already seen her open up a bit to my younger daughter as they draw, play with dolls, and run around the house. Play provides a safe haven for kids, allows them to be themselves, and provides a space where they can begin to address trauma and work through deep emotions. Eventually, this hard work equips kids to be more compassionate and empathetic to others. When one of our new friends tripped during hopscotch, my older daughter tried to help, but he pushed her away. I watched her regroup, find a ball, and invite him to play. Her creative approach opened the door to a deeper relationship, and I feel grateful that kids develop this skill through play. As children explore different outcomes during constructive play, experiment with colors while painting, and brainstorm ideas during free play, they stimulate their creativity and imagination, skills they use to build relationships and meet the needs of the people around them. Kids receive opportunities to include everyone regardless of race, religion, ethnicity, or ability as they play. We can help our kids learn to wait for a slower runner to catch up as they play tag, choose to play inclusive games with their disabled friends, and see beyond skin color as they take turns on the slide. 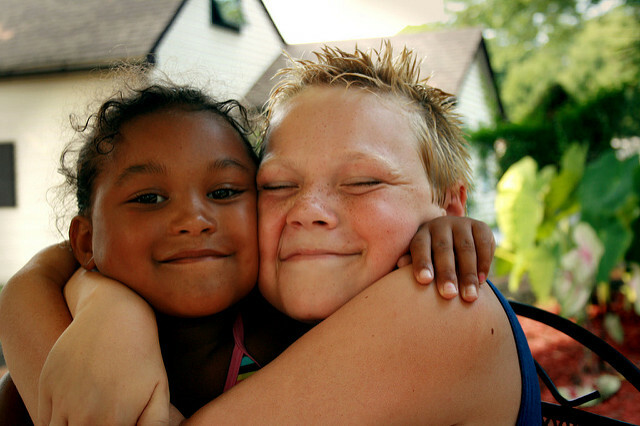 Through play, our kids learn to respect differences, include everyone, and value all life. Thanks to play, I've watched my girls cultivate compassion and empathy, two essential skills for life success. How have you seen play help your kids become more compassionate and empathetic?